When most romance readers were cutting their reading teeth on Woodiwiss, Rogers, Roberts, Deveraux and Garwood - I was reading mysteries and Gothics (for the suspense, not for the hints of romance). I read my fair share of gore (hello, Patricia Cornwell), but I tended to naturally gravitate towards "less graphic" authors like Mary Higgins Clark, Sue Grafton and Marcia Muller - and cozies. I used to love cozy mysteries. But over time either cozies changed or I did and I basically stopped reading them (outside of one or two authors). But nostalgia, it gets the better of me and in a bid to find new cozy writers I might enjoy I downloaded a few from NetGalley - only to leave them languishing. My romance reading being lackluster of late, and mysteries being the one thing keeping my attention at the moment, I decided to unearth A Dark and Stormy Murder by Julia Buckley, the first book in her Writer's Apprentice series. Lena London is an out-of-work 20-something who has just broken up with her boyfriend. So you can't really blame the woman for rereading her favorite Camilla Graham Gothic with her cat, Lestrade, by her side. That's when she gets a phone call from her BFF Allison, who is now married and living in idyllic Blue Lake, Indiana. Turns out Allison is in the same knitting group as Camilla Graham and after reading Lena's dissertation on her work, Camilla offers her a trial job as her brand new assistant! Say no more! Lena packs her bags, and her cat, and heads to Blue Lake. It doesn't take long for Lena to set the local gossip mill into overdrive. First, she befriends the local police chief, the most eligible bachelor in town. Then she's seen chatting up the local recluse, a man whose wife "disappeared" and everyone suspects he murdered her. As if that weren't enough? The dead body of a directionless local man is found on Camilla's property and Lena had seen him arguing with another man in the local hardware store that very morning. Oh the shenanigans! Let's start with the good. I really liked the premise of this series. Lena has her own ambitions to write, and Camilla needs someone to do all the regular "personal assistant" stuff along with some collaboration work. Lena knows her work so intimately, it's really the perfect arrangement. It would be like Teenage Wendy getting to live and work with Barbara Michaels. While the book is easy reading, and I plowed through it in a day, I realized that cozy mysteries haven't changed all that much, rather, I have. I also had the epiphany that cozy mysteries are to the mystery genre as small town contemporaries are to romance. They occupy an idealized (and white bread) world view that doesn't exist. Reading this book was a bit like reading about an alternate universe. Lena just instinctively KNOWS that her reclusive new neighbor didn't kill his wife and leaps to his defense faster than you can say Pollyanna. Everything is very cutesy and quaint to the point where the only thing missing from the town of Blue Lake is a cupcake shop or a yarn store. I can take this sort of thing in small doses but in single titles it gets on my nerves. Even the idea that a secondary character is rumored to have experimented with pot smoking is written in a wide-eyed gasping sort of way (I went to college, I've lived in California for over a decade, pot stopped being scandalous to me over 20 years ago). But, look, I get it. There are some who judge readers harshly for reading books of this ilk, but I'm not one of them. Hey, when the world is literally on fire all around us, with fresh new horrors served up daily (heck, in some cases hourly!) - there's something oddly comforting about escaping to Mayberry RFD. Putting their head in the sand? Maybe. But if it brings readers some small measure of escape and enjoyment, by all means - have at it. Don't mind me, I'll be over here reading a Tropetastic Harlequin Presents. 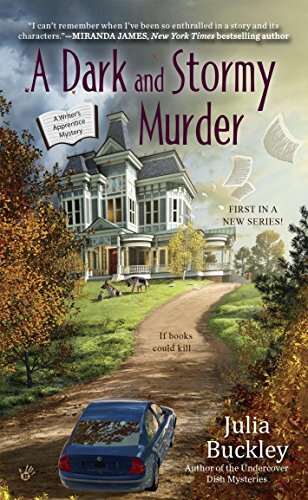 So while this doesn't seem to be "my thing" anymore, I can appreciate that it's a good idea for a series premise and if you like cozy mysteries (in other words, you're not excessively grumpy like me), then you might like this one. I read this, too, and wasn't thrilled with it. I have enjoyed, for the most part, her Undercover Dish Mystery series. But I have to be in a specific mood for most cozies, otherwise they just don't work and become monotonous. I have started reading some cozies with paranormal elements, which I do enjoy quite a bit. I hope you try some others and review them for us. This is spooky! I just finished writing my review and it should post tomorrow. Weird coincidence, given that this has been out for a couple of years. Anyway, I liked it less than you. I found Lena's ESP about the neighbour eye-rolling and her insistence that she just knows he's innocent incredibly annoying. She really did not do it for me! Rosario: Oh that's hilarious! How funny we both read this right around the same time. Yeah, Lena's blind faith that whats-his-face didn't kill his wife was so bad. There was no basis for it and she came off like Pollyanna crossed with those women who become pen pals with prison inmates. I probably would have DNF'ed a romance with such a heroine (in fact, I know I would have) - but I kept reading this one mostly because I wanted the resolution to the mystery. But yeah, no desire to continue on with the series. And your description of the tone being "adolescent" is VERY apt. I couldn't agree more.